Sometimes it just doesn't go right. You're out taking photos but you're not "feeling it", or you make a poor decision and miss a great shot. All you can do is call it a learning experience and try again another time. That was me on July 27th. I looked out around 8 PM and noticed the sky was looking nice, so I decided to hit the road and see if I could catch a sunset train or two. I debated which way to go - Rivers or Sprague subdivision - and decided to head east to the CN Sprague subdivision. Here's a map of the area, courtesy of Google Maps. The Sprague subdivision runs from the top left / northwest to the bottom right / southeast in this area. 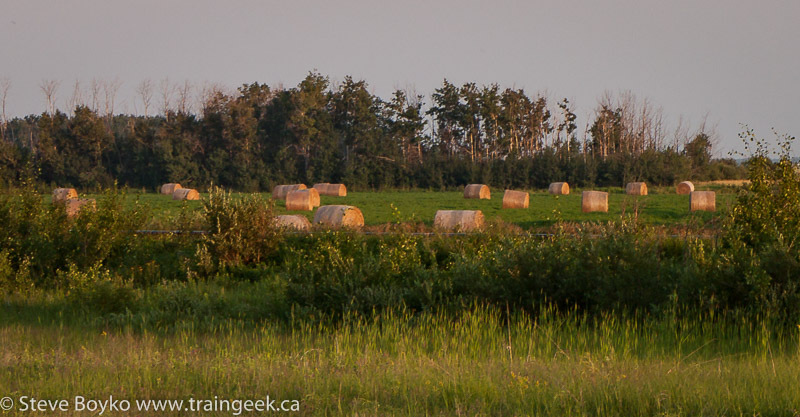 The Perimeter Highway runs around Winnipeg - hence the name - and highway 1 is the Trans-Canada Highway and parallels the Sprague for a number of miles out of Winnipeg. As I drove across the Sprague subdivision on highway 100, I saw headlights to the southeast. I was taking the exit to highway 1 anyway, as the sight lines on that overpass are such that you can't look directly southeast unless you are already taking the exit. Often I take the exit while looking for trains, and if I don't see any, I turn around short of Deacon's Corner and go somewhere else. The train was close... closer than I would have liked. I didn't have much time to pick a spot to photograph it. It was too late to stop and photograph it from the overpass. I could have stopped just after the bridge over the floodway and taken a side shot, but I wanted to be on the other side of the train - the sun side. As I approached the highway 207 intersection it was clear they were going to get to the intersection before I did, so I had to pull over and shoot from the highway on the "wrong" side of the light. Fortunately I was fairly close to the tracks at that point but there was a lot of brush in the way. Nice light on the nose... BC Rail second unit... wait, what's that in third position? 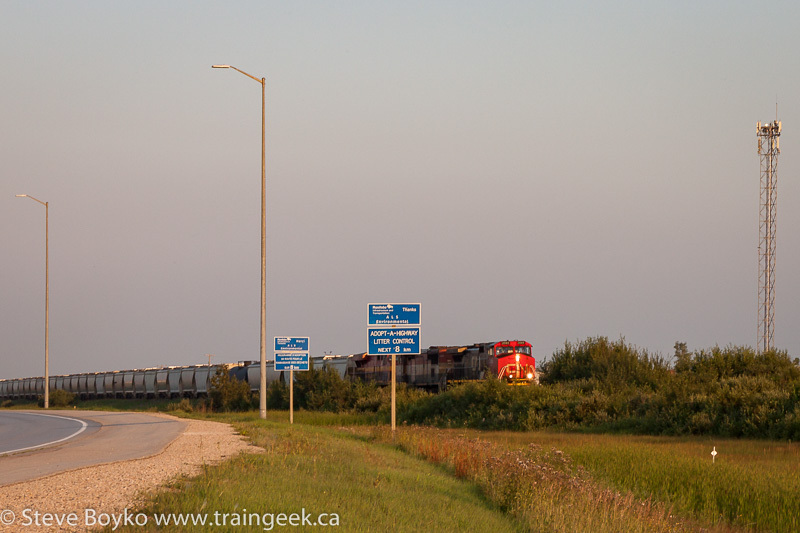 Kansas City Southern 4692 was paying a visit to Winnipeg! What luck! That was exciting. This was only the second time I've seen a Kansas City Southern unit. 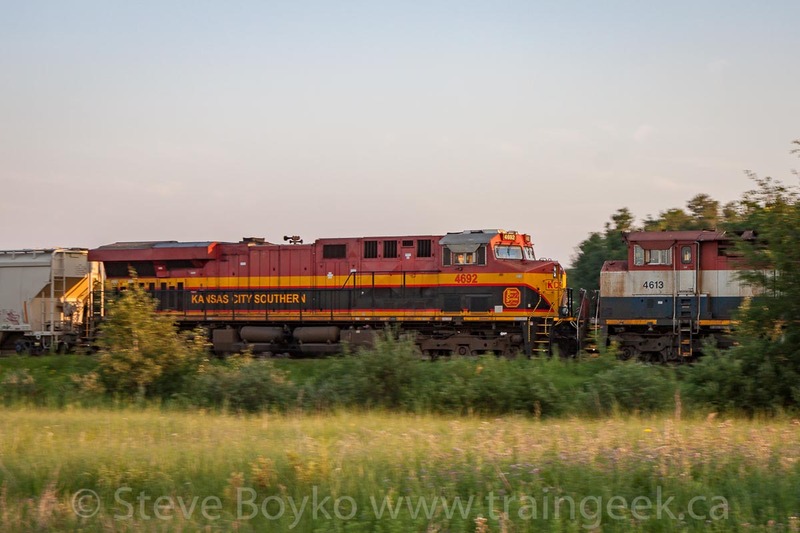 I know I haven't blogged about the first time I saw a KCS unit (two, actually) but if you were on my mailing list, you would have seen the photos. You're on my list, right? You know where to go to sign up.. The train was entirely covered hoppers... maybe a frac sand train? As the tail end approached, I spotted something else interesting on this train. The passenger car was CN CHAMPLAIN (ICMW 101314). I saw this car back in September 2014. As I understand it, unoccupied business cars like this are supposed to be marshaled at the rear of the train, but there is some rule about not being the last car on the train... I had a quick look but I couldn't find the regulation. I photographed it, but I was not satisfied with shooting it from the "wrong side" of the sun. I decided to try to get ahead of the train and photograph it from the other side of the train. 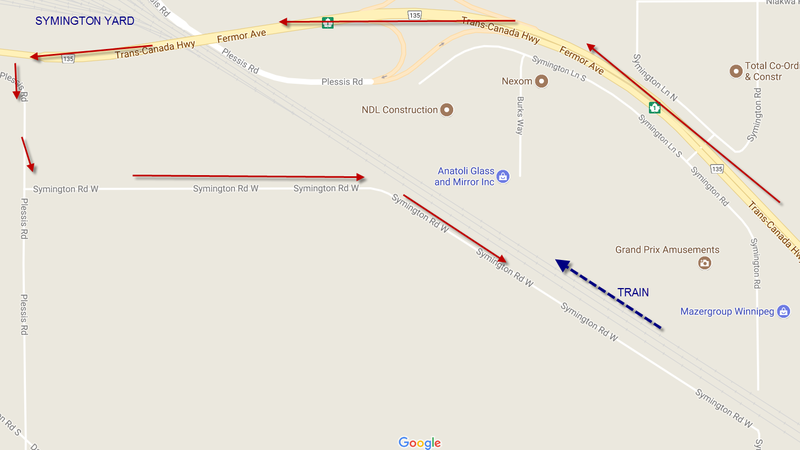 I had two possibilities... beat the train to the crossing at Tinkertown Amusements (see map above) or take Fermor Avenue overpass and find a spot there. By the time I caught up to the head end, they were already in the crossing, so the Fermor overpass was the only option. I was there well before the train, and I noted that two tracks were being used to feed the hump yard in Symington. I thought about shooting from the overpass but I thought the view might be blocked by the strings of cars feeding the hump. 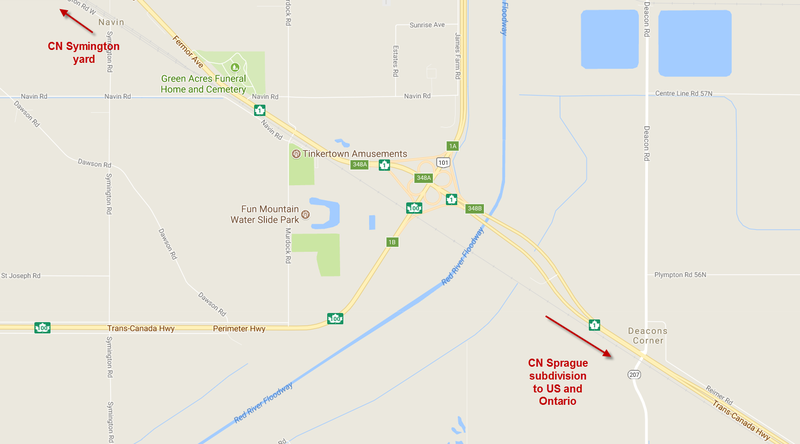 I zipped around on Fermor / Plessis Road / Symington Road - see map below. The red arrows indicate my trip and the blue arrow indicates the train's direction of travel. It's a bit annoying to have to go all the way around, but there's no crossings, so... you can see where there used to be a crossing at bottom right. You can still go to the end of Symington Road (N) but the view is very restricted there. The Symington Road on the south side of the tracks is much better in the evening as you are on the "good" side of the light. Fortunately I got there before the train, so I could photograph it before it disappeared behind freight cars. Here's the other side of KCS 4692. By then the light was pretty low and I was shooting at 1/60s shutter speed so it's a bit blurry. 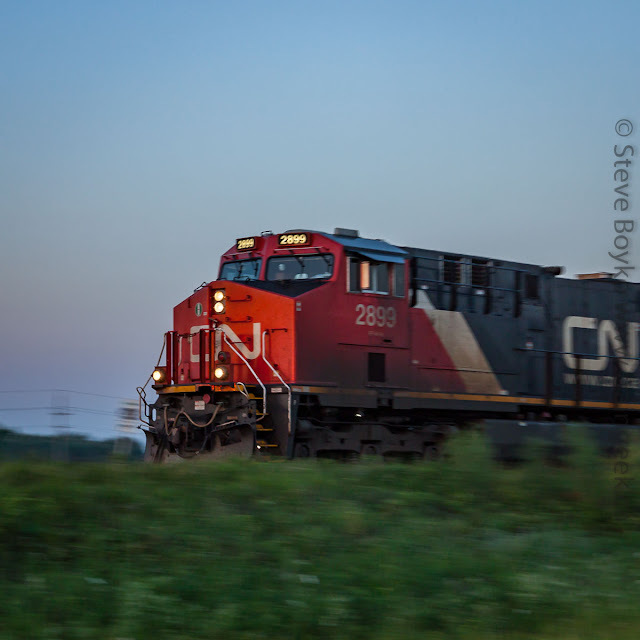 They passed the hump yard units - CN 6015 and friends. Here's the tail end passing the hump yard units. Those last two might be my favourites of this train. I know I complained about the telegraph wires but I think they added to these shots. I had a hunch there was another train coming on the Sprague subdivision. I don't know why I felt this.. but I had a feeling. 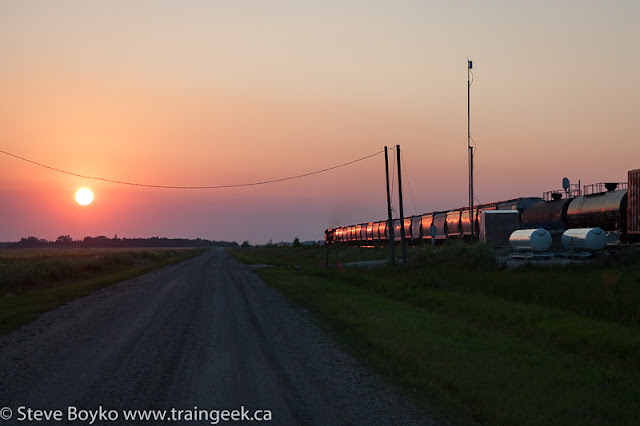 I headed east on the Trans-Canada toward Lorette siding to see if my hunch was correct. As I approached the Lorette siding - the first one on the Sprague subdivision - I saw the lights facing west were lit - red. That meant there was a train on the east side of the signals. It didn't say anything about whether the train was going east or west, just that there was a train in the block. I continued up to the siding and in the distance I saw headlights. My hunch was right. 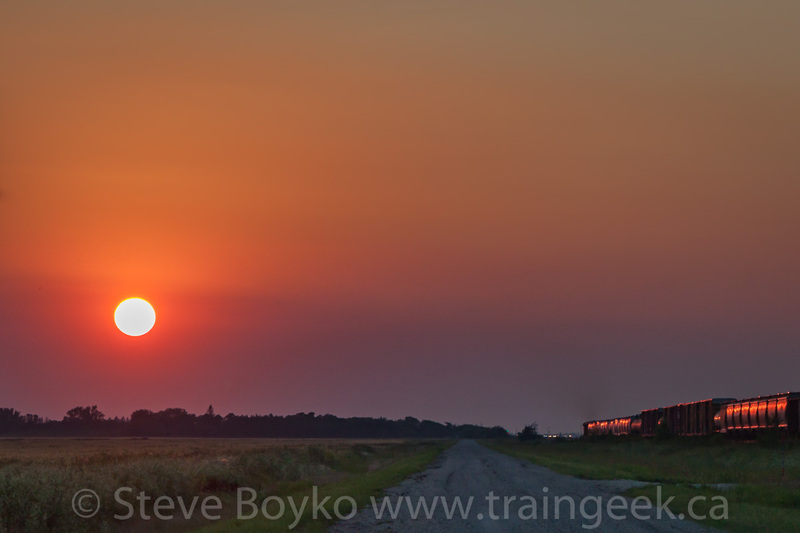 By this time I was past the start of the siding, so I had a couple of choices if I wanted to get on the "sun" side of the train. There is a private crossing in the middle of the siding. I'd never used it so I had no idea what the view was. The other option was to continue to the west end of the siding, where I knew there was a signaled crossing. I chose this option. I didn't have much time, but I made it there a good 30 seconds before the lights started flashing. I saw there is a dirt road paralleling the track on the west side, so I drove my Civic down there toward the signals, thinking maybe of including them in the shot. Bad idea. I slammed on the brakes and bailed out to get the shot. Someday I swear I'm going to forget to put the car in park. The above pan was the best of the photos. That was at 1/50s and the train was really motoring along. The next photo shows why I picked a bad location. Notice the giant wire and poles totally ruining what could have been a lovely sunset photo. Remember when I talked about careful composition? I didn't do that here. Driving just a bit farther would have opened everything up and that lovely sunset photo would have been possible. I didn't have time to set up the shot and I blew it. I did manage to salvage a half decent photo with some serious editing. At least I got the exposure right for the setting sun. So those were my two "learning experiences". Look for shots without "foreground clutter"
If you like abandoned places, check out BW Bandy's blog Everybody Has To Be Somewhere. He posts frequently and includes a few grain elevators now and then. He likes photographing hay bales, so I took this photo between trains and include it here for him. I'm not photo expert, so all that I will say is that you had a great catch there. Keep it up! I have so many moments like that, I could write a book. I believe, though, that you can always make something out of a bad situation. I think the shots with the old disconnected wires tells a story. And nice work grabbing a KCS unit and CN business car in one night. All in all, I would still call it a successful outing. I agree, the wires do tell a story. I probably will be glad I did include them. It was a successful outing after all. I just think it could have been a lot more successful if I had paid a little more attention. Thanks, Jenn! Which train did you take? This is why I stick with hay bales.